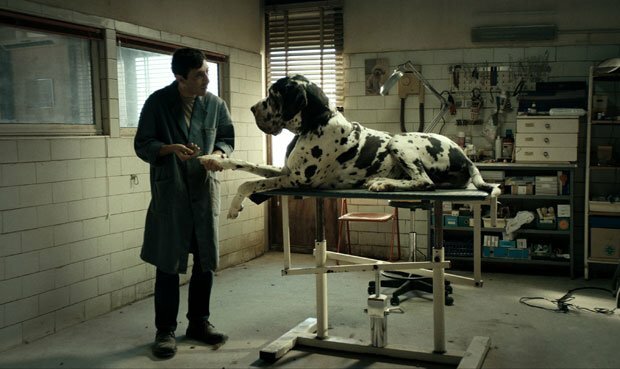 Even the weakest, meekest worm turns in Matteo Garrone's Dogman, a pungent, atmospheric tale of crime and punishment. There are echoes of his hugely successful Gomorrah (2014) in this violent, plaintive account of toxic masculinity and the way that fear eats the soul.The main attraction is a magnificent performance from Marcello Fonte, which won him the Best Actor prize at Cannes. Fonte has the look of a melted, smudged Al Pacino, a hangdog expression and soulful eyes that reflect a gamut of emotions from jubilation to abject terror. His mild-mannered Marcello is a dog groomer in a seaside town that makes the expression 'rundown' seem inadequate. This is a place where hope comes to die. Cinematographer Nicolai Brüel does a beautiful job of capturing its soulless concrete buildings, glowering skies and a desolate square of crumbling shops that looks like the city street in an old western. Marcello has a big heart and a way with all creatures great and small. The most endearing scenes focus on the affectionate bond he has with his young daughter and the way he can tame the wildest canine with a soapy bath and a blow dry. The one creature who seems beyond his reach is local thug Simone (Edoardo Pesce), a former boxer willing to exploit Marcello as the unwitting accomplice in his life of crime. Simone's testosterone-fuelled rages and bully boy tactics constantly intimidate and humiliate Marcello. There is a misguided sense of loyalty and a belief in fairness that allows Marcello to keep thinking that Simone might respect him. It is a measure of Fonte's nuanced performance that we remain sympathetic to Marcello as the violence grows more intense, and we have to acknowledge that this a world in which he never had a chance of being his best self. Marcello (Fonte) is a mild-mannered dog groomer in a seaside town in Italy who deals a bit of cocaine on the side, and who gets involved with local thug Simone (Pesce). Violent, plaintive account of toxic masculinity and fear eating the soul, with a magnificent performance from Fonte, who won Best Actor at Cannes.